KO BROWS single lash extensions uses soft Velvet lashes and attach them to your own lashes individually, to create beautiful, light and natural looking lashes. Choice of lashes ranges from different length, thickness and curl type to suit your needs. We offers customization of styles to suit each customer’s preference as well. 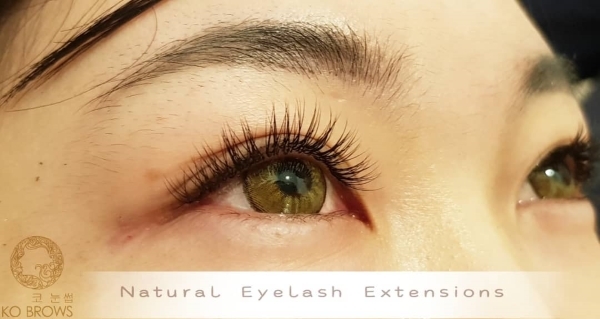 Our experienced specialists will look at the length, thickness and curl type of the extensions to customize the most natural-looking set of single lash extensions for you. You also get a nice, pampering collagen eye treatment as part of the service. We provide single lash extensions touch up, lash removal and eyelash perm services. Try our K-Natural Fantasy Eyelash Extensions today! Comes with high quality lashes, Lashes Spa, Collagen Eye Treatment and Return lash removal! Imported ingredients. Korean Consultant and Specialists. 1-1 Personalized Consultation, Aftercare kit and guide will be provided.